No faster way of Selling. The process can take as little as six weeks from instruction to exchange. Your property will be advertised very intensively in the local press prior to Auction and also nationally through specialist publications targeting investors and professional buyers. It will be featured in our mass produced catalogue, which is professionally designed and printed. We set up special viewing times for your property, each hosted by a member of our Auction team who can talk knowledgeably about your property. It enables us to judge interest and help guide you in setting the reserve. Our aim is to generate interest from as many prospective buyers as possible and encourage competitive bidding. This should lead to the best possible price being achieved on the day. Sometimes buyers are so keen to secure the property they make a pre-Auction offer, but we would only recommend acceptance if in our view that figure was unlikely to be exceeded and Auction conditions would still apply. Often properties achieve a sale price at Auction in excess of the guide price and you can always be sure that your property has achieved that best price on the day. This is particularly important on Probate properties where Executors are required to achieve the “Best Price” and everything at Auction is open to public scrutiny. With private sales a price agreed is not always the price you finally receive. With Auction there is no renegotiation, no discounting to take into account survey findings or any last minute gazundering. With Auction your buyer will have fully researched the condition of the property prior and cannot reduce the sale price after the hammer has fallen. If you are in a hurry or have a deadline to meet then Auction could be right for you. From the outset you will know the date of the Auction and legal completion is usually set for 28 days thereafter. This timescale is fixed and legally binding on both parties. Financial pressures and the need to relocate or dispose of a property can be easily accommodated and almost always met with a sale by Auction. We sell all types of property at Auction, particularly those requiring refurbishment, offering scope for conversion or redevelopment, are unusual, in a highly sought after location or similar. We sell, vacant houses and flats, industrial property, offices, shops, pubs, commercial and residential investments, land, development opportunities, Chapels, Churches and Ground Rents. Auction offers a potential alternative method of disposal for properties that have failed to sell by private treaty or are not suitable to be offered in this way. Always ask a solicitor to look over a legal pack if you are not competent to do so yourself. A 10% deposit (minimum of £2,000) is taken on the day of auction, this can only be paid by cash (up to the value of £8,000), cheque or bankers draft. No debit or credit cards can be accepted by way of a deposit. if successful, a Buyers Premium of 0.5% with a minimum of £600 (incl. of VAT) is payable. The bidder must download and complete a separate authority form and provide either a personal cheque, bankers draft, solicitor’s clients account cheque, or cheque signed by a Building Society, for 10% of the maximum amount bid for each lot. 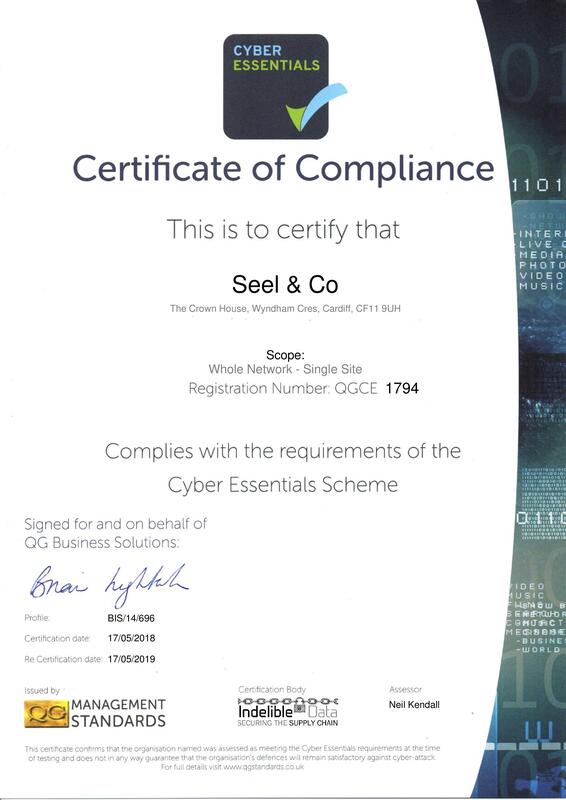 This is subject to a minimum of £2,000 (as applicable) made payable to: Seel & Co Ltd. In addition to the deposit, a buyer’s premium of 0.5% with a minimum of £600 (incl. of VAT) is also payable. The form must be sent or delivered to: The Auctioneers office, The Crown House, Wyndham Crescent, Cardiff, CF11 9UH, to arrive before 5pm two working days prior to the date of that month’s relevant auction. It is the bidder’s responsibility to check that the form is received by telephoning the auctioneer’s office. The bidder shall be deemed to have read the bidders’ notice and the particulars of the relevant Lot in the catalogue and the General and Special Conditions of Sale. The prospective purchaser shall be deemed to have taken all necessary professional and legal advice and to have made enquires and have knowledge of any announcements to be made from the rostrum of any amendments relating to the relevant lot. Announcements can and should be checked by bidders on the day of the auction. In the case of telephone bids attempts will be made to contact the bidder by telephone and if successful, the bidder may then compete in the bidding (up to the maximum of the amount authorised in the completed authority form). In the event that the proposed bidder cannot be contacted or communication breaks down, or there is any confusion or disruption, the auctioneers will bid/continue to bid on behalf of the bidder up to the maximum of the authorisation. In the case of written bids the auction staff will compete in the bidding up to the maximum of the authorisation. The right is reserved not to bid on behalf of telephone/written bidders in the event of any error, doubt, omission or uncertainty of the bid for any reason whatsoever. No warranty or guarantee is given that a bid will be made on behalf of the bidder and no liability is accepted in this regard. In the event that the telephone/written bid is successful the auctioneer will sign the Memorandum of Contract on behalf of the bidder as a contract would have been formed on the fall of the hammer. In the event of a contract, the deposit monies will be applied so far as necessary to meet the requirement for a 10% deposit. In the event that the bidder is unsuccessful in gaining the contract, the deposit monies shall be returned to the bidder promptly. Once delivered to the auctioneers, the authority to bid is binding on the bidder up to 9.00 pm on the day on which the particular lot is auctioned. This is to allow for the possibility of a vendor agreeing to sell post-auction where the bidding has not reached the reserve. The authority can only be withdrawn by notification in writing delivered to the offices of Seel & Co, two hours before the start of the auction on the day the relevant lot is scheduled to be auctioned or by delivery into the hands of the auctioneers in the auction room half an hour before the start of the auction that day. It is the bidders responsibility to obtain a receipt on a copy of the withdrawal notification signed by one of the auctioneers staff and without such a receipt the authority stands and any successful Contract is binding on the bidder. If the bidder, or the agent, actually bids at the auction without having previously withdrawn the authority, the auctioneer is at liberty to accept such bid in addition to any bid from auction department staff as empowered under the telephone/ written authority form. The auctioneers would have no liability whatsoever if the price achieved is the result of this competition in bidding without intervention from other bidders. Attention is drawn to the general conditions of sale relating to all properties. All prospective purchasers are invited to obtain copies of any special conditions specified in relation to each lot. In addition to the deposit a buyer’s premium of 0.5% with a minimum of £600 (incl. of VAT) will be payable. All prospective purchasers shall be deemed to have inspected the property and made usual pre-contract enquiries and searches. Prospective bidders should check the addendum sheet available in the auction room for alterations and amendments. The successful bidder is under contract as soon as the auctioneers gavel falls on his or her bid. On a property being knocked down, the bidder must immediately provide to the auctioneer’s clerk his/her full name and address, together with the name and address of the solicitor acting on his/her behalf to enable the Memorandum of Contract to be completed in the form, as printed in the auction catalogue. This must be signed by the bidder and exchanged with the auctioneer’s staff and vendor’s solicitor prior to leaving the room, accompanied by a minimum deposit 10% of the maximum bid or £2000 – whichever is the greater. Details relating to each lot are set out as a general guideline only for the guidance of intending purchasers or lessees and do not constitute part of an offer or contact. All descriptions are given in good faith and believed correct, but any intending purchaser or tenant must satisfy themselves by inspecting or otherwise as to the correctness of each item. The auctioneer has not tested any apparatus, equipment fittings or services and so cannot verify that they are in working order. The buyer is advised to obtain their own verification. Photographs and any plans published are for convenience of prospective purchasers only and do not form part of any contract. Any sizes quoted are all approximate and for guidance only and do not form part of any contract. All properties are offered with vacant possession unless otherwise stated. No person in the employment of the auctioneer has any authority to make or give any representation or warranty whatever in relation to any property listed in the auction catalogue. In the event of there being any addendum to the particulars of sale or the General and Special Conditions of sale, a copy of the addendum will be attached to the Memorandum of Contract and shall be signed by the purchaser and such addendum shall be deemed to form part of the sales particulars and conditions of sale and if in conflict, shall prevail. Inspection of investment properties is by courtesy of the tenants. Inspection of properties with vacant possession is by arrangement with the auctioneer or joint auctioneers as indicated in the auction catalogue. Prospective purchasers intending to bid at the auction for a specific lot are advised to consult with the auctioneer before the sale to enquire whether the particular lot will be offered at the auction. The vendor has the right to sell prior to auction or withdraw the lot and neither the auctioneer nor vendor is responsible for any abortive costs, losses or damages of a prospective purchaser. Guide prices quoted in the catalogue and online are provided as indication of each seller’s minimum expectation. They are not necessarily figures which a property will sell for and may change at any time prior to the auction. The sale price will be dependent on bidding in the auction room and on the vendor’s instructions. Each property will be offered subject to a reserve price which will be set at no more than 10% above a single figure guide price or within a guide price range. This is a confidential figure set between the vendor and the auctioneer just prior to the auction. It is a figure below which the auctioneer cannot sell the property during the auction. After the auction offers will be sought and considered on unsold lots at prices below the reserves prices.